Ellie Angelini was a chef instructor at three restaurants before launching a cooking school from her home kitchen, aiming to impart the simple joys that come from savoring each step of the meal’s preparation. This includes shucking a box of peas in the backyard or making sauce out of a hundred pounds of tomatoes. Angelini graduated from Le Cordon Bleu College of Culinary Arts in San Francisco in the top 1 percent of her class, but she wasn’t always the cooking doyenne she is now. As one of four girls in her family, Angelini says she learned to cook out of necessity when she was 8, and some of her early attempts were less than successful. “My dad said I was the only person who could take a perfect cut of meat and make perfect shoe leather out of it,” she said with a laugh. 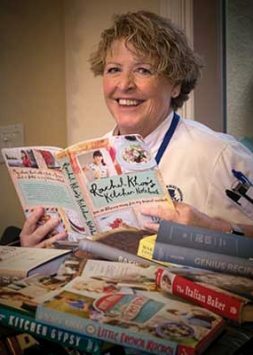 It wasn’t until she signed up for home economics at Half Moon Bay High School that her cooking skills flourished. And, perhaps not coincidentally, the class is also where she and her husband, Joe, fell in love. “Looking back now, if I’d known (I was going to marry him), I’d have made him learn it too,” she says. 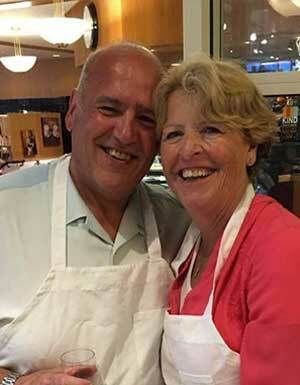 Helping others learn to cook is almost as great of a joy for Angelini as cooking itself. She started by teaching her four grandchildren to cook, and branched out into teaching classes. Now Angelini runs a business from her kitchen, teaching children age 5 and up and leading classes for adults. She also cooks for corporate events using ingredients from the coastside area, like Harley Farms goat cheese, Marilyn Johnson’s jams, and local Brussels sprouts. She is expanding her cooking classes into six-week programs for children. The classes will start with basic kitchen knife skills and apply math and science to the kitchen. It’s important to Angelini to teach young children the lost art of cooking, as home economics classes become a thing of the past. Despite her deep knowledge of cooking, Angelini doesn’t plan to publish a cookbook. “I love to hold them and read them,” she said, “but if you go into a bookstore they’re the ones on clearance,” she said. With the advent of the internet, cookbooks are becoming obsolete, she added. “It’s like an encyclopedia — you’re not going to find one if you go into a home,” she said. She does, however, plan to start a blog someday with her techniques and tips for cooking. One favorite dish she may feature? “I love risotto, and I think it’s because of the time that goes into it,” she said. “It’s not something you rush; you take care of it the whole way through. “I love the nurturing aspect of cooking,” Angelini said.